Environment Minister Dustin Duncan has approved a large-scale wind energy project in the province. This is the first large-scale wind energy project approved under The Environmental Assessment Act. The turbines will add 177 megawatts of wind energy for SaskPower customers – enough energy to power more than 70,000 average Saskatchewan homes. Construction is anticipated to begin in 2019, with possible service as early as 2021. “This new wind energy project demonstrates our government’s commitment to renewable energy and greenhouse gas emission reductions, both clear goals in our comprehensive provincial climate change strategy,” Duncan said. Prairie Resilience, the province’s made-in-Saskatchewan climate change strategy, is designed to reduce greenhouse gas emissions, prepare for changing conditions, and protect people and communities through resilience and readiness. The strategy includes a target to reduce emissions from electrical power generation by 40 per cent by 2030, with a significant focus on wind energy. The Blue Hill Project will be the seventh privately developed wind power generation project in Saskatchewan. The project site is located outside of the avoidance zones identified in the Wildlife Siting Guidelines for Saskatchewan Wind Energy Projects. Algonquin selected this location on cultivated agricultural land in order to avoid impacting native prairie grassland and important wildlife habitat. The company also conducted rigorous wildlife surveys as part of the environmental impact assessment (EIA) and has proposed appropriate mitigation to reduce potential impacts to migratory birds, bats and habitat. 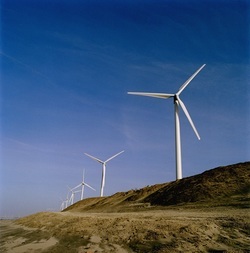 adhering to minimum wind cut-in speeds of turbines. Algonquin will adhere to the Ministry of Environment’s Adaptive Management Guidelines for Saskatchewan Wind Energy Projects, which include standards for post-construction bird and bat fatality monitoring and mitigation. The guidelines provide regulatory clarity to support responsible wind energy development and operations in Saskatchewan, ensuring that wildlife and habitat impacts are satisfactorily avoided, minimized and offset to meet compliance requirements. Throughout the EIA, Algonquin engaged with stakeholders, including local communities and environmental non-governmental organizations, in order to provide information about the project to address any concerns.